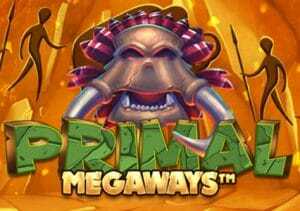 Go back in time with Blueprint Gaming and their prehistoric-themed Primal Megaways video slot. This 6 reel game is played using Big Time Gaming’s MegaWays game engine where the number of possible ways to win varies with each spin. Fully expanded the reels can offer 46,656 MegaWays. There’s also a bonus round that awards up to 30 free spins (initially) with wild multipliers that can combine to potentially spectacular effect. Play on all devices from between 20p and £150 per spin. The cartoon design in Primal MegaWays is impressively done. With all the moving parts from the MegaWays game engine, the visuals could easily get cluttered. That’s not the case here though. Everything is bright and nice and clear. On the granite reels you’ll see stone-style A to 10 values as well as an assortment of prehistoric creatures. The best of these is the woolly mammoth. Land 2, 3, 4, 5 or 6 of these on adjacent reels for a payout of 0.5, 1, 5, 10 or 50 times your total bet. The paw print is the wild. This substitutes for all other symbols apart from the skull bonus. These wild multipliers can land anywhere other than reel 1. If you land 2 or more of them on the same free spin, then the multipliers are combined. For example, a pair of 2x multipliers plus a 3x wild multiplier would result in the payout being boosted by 12x. If you were to get a 6x multiplier across all 6 reels, you’ll be benefitting from a mammoth 7,776x multiplier! There are ample opportunities to re-trigger more free spins here too. Land 2, 3, 4, 5 or 6 bonus skulls and an extra 5, 10, 15, 20 or 25 free spins are added to your total. There’s no limit to the number of possible re-triggers. Finally, all standard wilds become wild multiplier for even more payouts. If you win less than 10 times your bet, the Free Spin Guarantee feature kicks in meaning you’ll play the Primal Bonus feature again. We’ve found the previous MegaWays video slots to be a bit hit and miss. Primal MegaWays is definitely one of the better ones. The sounds and visuals are excellent and the gameplay, though relatively simple, offers some decent potential. That’s certainly the case with the free spins round where the wild multipliers can quickly work some magic. Be warned though. This is a volatile video slot. Get lucky with the wild multipliers during the feature and Primal MegaWays can deliver some potentially mammoth rewards – to the tune of 10,000 times your bet on every single free spin! I also recommend you try other Blueprint Gaming titles with Grizzly Gold and The Goonies good choices.